This blog summarises a CHI’19 late breaking work paper, authored by Alexandra Kitson, Steve DiPaola, Bernhard E. Riecke. It will be presented at the ACM Conference on Computer-Human Interaction (CHI’19) during the poster sessions on May 7 at 10:20–11:00 and 15:20–16:00 and at the Interactivity Hot Desk on May 8 @ 15:20–16:00 and May 9 @ 10:20–11:00. Simply put, lucid dreaming is the ultimate virtual reality. Lucid dreaming is knowing that one is dreaming while in a dream and can allow the dreamer to take control of the dream to experience virtually anything, whether that’s flying, facing a fear, or diving deep into consciousness. The practice of lucid dreaming can be quite involved, with no sure-fire way of inducing a lucid dream. Our research at the School of Interactive Arts and Technology, Simon Fraser University looks at how technology can potentially be a tool to help people learn to have more frequent and sustained lucid dreams in a way that is creative, playful, and intrinsically rewarding. With all of these techniques, there is no way of knowing if you are practicing correctly, and visualization can be difficult if you’ve never experienced a lucid dream before and because you can’t see someone else do it by example. Thus, we sought to find a technological solution to help people practice these proven techniques of lucid dreaming in a way that provides more concrete feedback. The two main approaches of lucid dreaming training we focus on are practicing focused awareness and visualizing becoming lucid. Schematic of Lucid Loop. Image edited with Deep Dream and epainterly by Steve DiPaola. To do this, we use neurofeedback with a consumer grade EEG, Muse 2, and an immersive virtual reality simulation whose visuals and audio become more lucid or clear as you focus your awareness. Our visuals and audio are based on phenomenological accounts of active and proficient lucid dreamers. The visuals are generated with deep dream and epainterly, an artistic machine learning system developed by Dr. Steve DiPaola’s lab, to help create a dream-like aesthetic that matches lucid dreaming reports and is intrinsically rewarding to interact with. The audio starts at a whisper and becomes louder and clearer as you focus your awareness to help gently guide you to a more relaxed and aware state. Our system, Lucid Loop, is still in development. 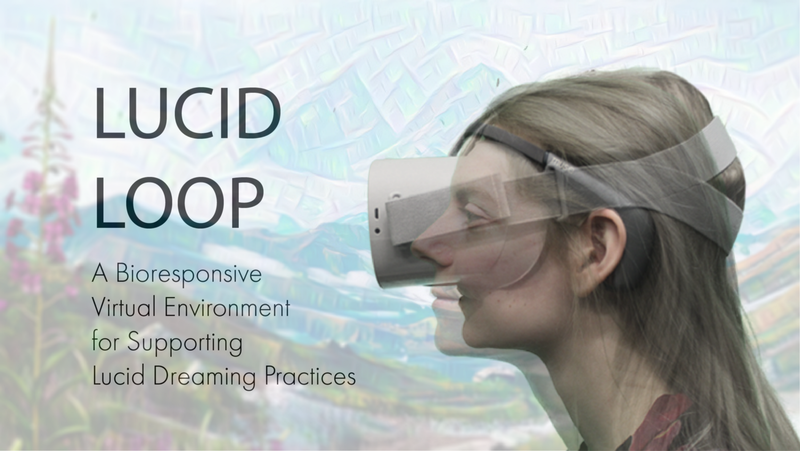 We will be presenting Lucid Loop at CHI’19 during the poster sessions on Tuesday, May 7 @ 10:20–11:00 and 15:20–16:00 as well as at the Interactivity Hot Desk during the coffee breaks on Wednesday, May 8 @ 15:20–16:00 and Thursday, May 9 @ 10:20–11:00. Lucid dreaming holds a lot of promise for mastering fear, creativity, rehearsal, wish fulfillment, healing, and transformation. We need evidence-based techniques and tools of supporting lucid dream induction not only to bring lucid dreaming to anyone who wants to try it but also to bring a deeper understanding of sleep, lucid dreaming, and consciousness. You can follow this project on our website and blog.